Well well well, look who decided to make an appearance. It's been a while, eh? At any rate, I am glad you are here. I'm glad to BE here. We have a lot to catch up on, so I thought I'd start with a story. A BIRTH story. In some ways very similar to the birth of Mia, and in many ways, different. Here goes. I had decided fairly early on in this pregnancy that I wanted to try using a midwifery practice for my prenatal care + birth, vs. a standard OBGYN. 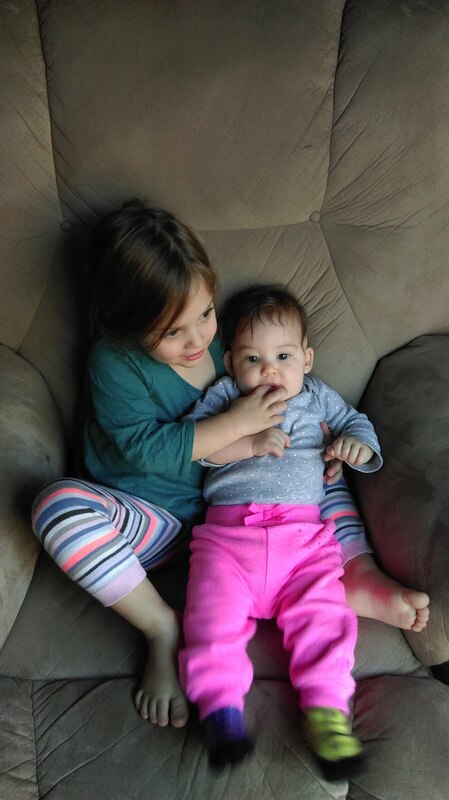 I really liked my OB, but with my crunchy friendships rubbing off on me (ha) and my continued desire to go for another natural, unmedicated birth, I went with the midwives at Bethany Womens Center. I really liked them! 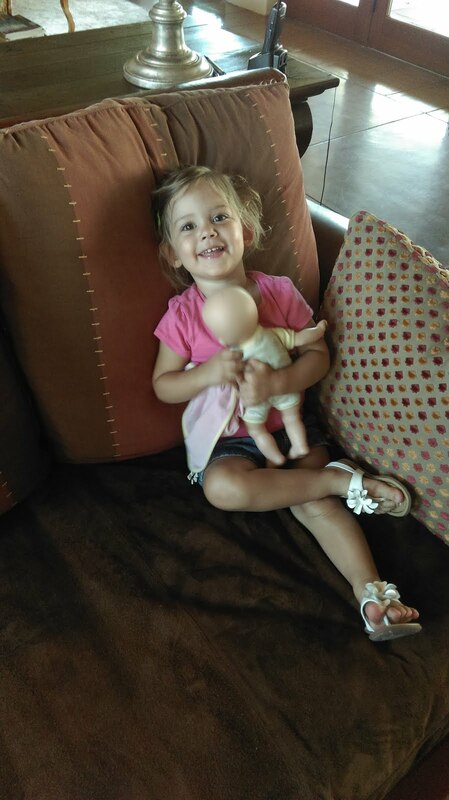 --Mia, 2 yrs 2 months, was SO ExCITED about the baby coming. 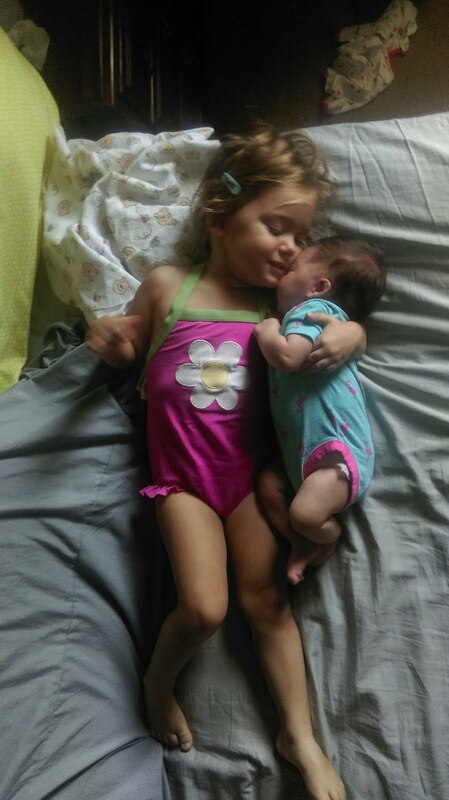 She had some serious baby fever. We were almost just as excited to see Mia meet her new brother or sister, as we were to meet him/her ourselves. 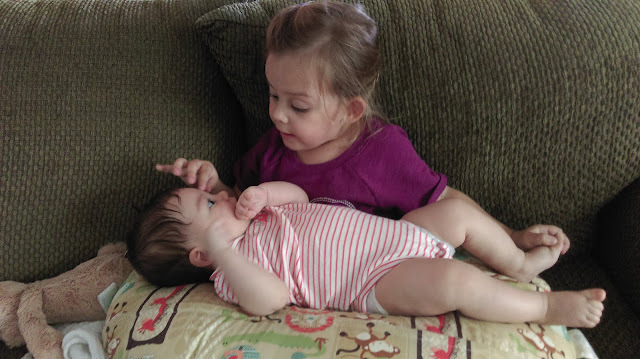 Playing with her favorite little baby at our cousin's house, just before her sister was born. So...Midwife appointment on Tuesday, July 7th, 39 weeks pregnant, I decided to let them check me to see if anything was happening. I turned out to be about 1-2 cm dilated, +2 (which was a little crazy), and the head was posterior. 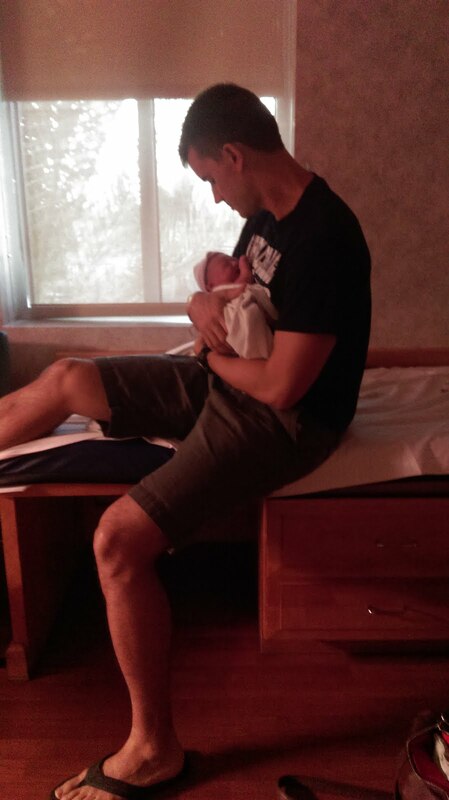 They told me to go home and do a lot of hands-and-knees positions to get the baby to flip. I was a little nervous and went home and read the spinning babies website about 10 times over...from on my hands and knees position on the floor. 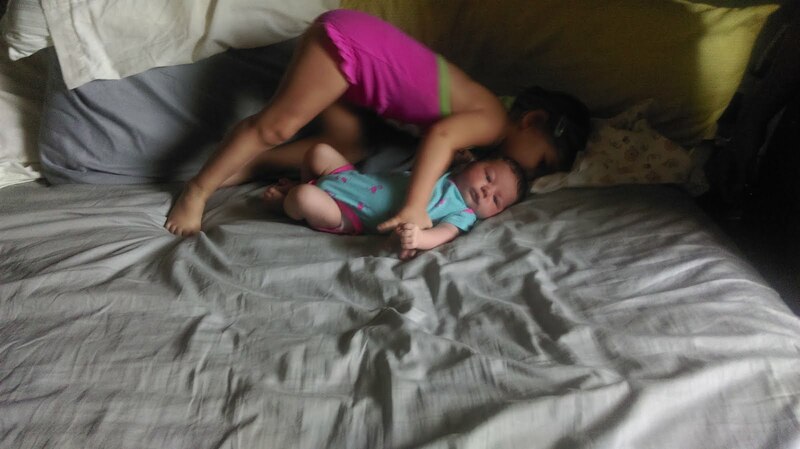 I had been having irregular braxton hicks contractions for a few weeks now, which was different than with Mia - with her I had zero BH contractions. I decided to go to my chiropractor to see if that might help with the baby's position. 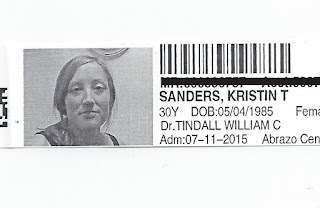 I didn't get an appointment until Thursday morning, but after I was adjusted I felt hopeful that it would help. After Mia's nap that afternoon, I took her to the Biltmore outdoor shopping mall and even though it was super hot, we walked around under the misters spraying us with that glorious mist, and I walked and walked and walked, and I felt a bunch of BH contractions. After that we went home and during dinner I thought it seemed like the contractions were getting more regular. I thought it was something to note, but I didn't get my hopes up. I DID get some things in order, just in case, including recording and posting a podcast episode - which funny enough was of me reading Mia's birth story. 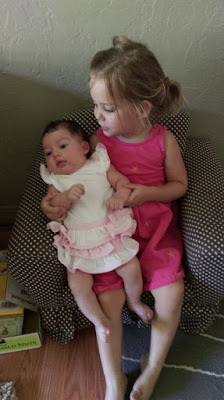 I went to bed at about 11 pm that night, but couldn't sleep at all through the contractions. I kept track of their timing and noted they were between 7-15 minutes apart. 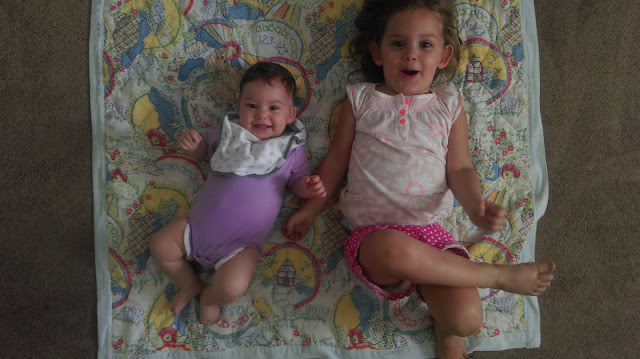 At every contraction I felt the urge, whether it was mentally because I thought it would help, or my body was telling me physically, to get on my hands and knees. After sleeping from 1-3am I was back up with the contractions, same story, 7-15 minutes apart, never more, never less. When Joel woke up for the day on Friday I told him what was going on and we both decided he should probably stay home from work. If nothing else, I was going to need help with Mia since I got only 2 hours of sleep and who knew what was going to happen with the contractions. I slept one more time that day from 10am-noon, which was either due to my body letting up on the contractions or me just sleeping through them. As the afternoon wore on, I was beginning to realize that I wasn't really able to talk through the contractions and I vaguely remembered in my childbirth class from before Mia was born that it was a sign they were probably real contractions. I remember specifically needing to stop in the middle of reading a book to Mia to breathe through a contraction, and made a mental note of it but just kept on. I had spoken with my doula Laura earlier that day about what was going on and she told me that, of course, it could be 2 hours, or 12 hours, or a whole week of this type of thing, and to just keep getting as much rest as possible. Honestly, that was not really the news I wanted to hear, no matter how true it was. I hoped and hoped and prayed it would not be a week of this! Before dinner that evening we had a great time sitting outside on our front lawn as the sun set and the heat let up. Contractions continued the exact same, 7-15 minutes, no talking during. We chatted with our neighbors, and even got some ice cream from the ice cream truck! I was sooo excited about the ice cream sundae cone my neighbor bought for me, I don't even want to TELL you that my husband ate it a week later, thinking I had forgotten about it. Which I did. Until I didn't. And then it wasn't there. At 9pm that night I was getting a tiny bit exhausted. And by a tiny bit, I mean, break-down-crying-mode. I posted in my close mama friends' Facebook group that I was getting disheartened by this, (and got so much encouragement from them!) expecting to not sleep again that night with the possibility that this could go on for days. I was so mentally and physically tired, and the contractions were getting worse. It is so funny as I look back on it now, how obvious it was that labor was progressing. Joel even tried to explain it to me, reminding me of all the signs that it seemed like it was progressing. But it just didn't click in the moment. I think I was just trying to prepare myself for the long haul, just in case. So we went to bed about 10pm and same thing as the night before, no sleep was had. However, I did start to feel a little different. It felt like something was churning inside me, and honestly I was hoping for a BM, knowing that that would also be a sign of progression and getting closer to the finish line. After some 7 minute contractions, I was so relieved when I had to get up out of bed to have a BM. It was 1:00am. I went to the bathroom, and after I was finished I immediately had a strong contraction. I stayed in the bathroom and leaned against the tub on my knees, and when it was over I waited a few minutes to get back up, but wait! 4 minutes later, another hard contraction. And then another one 4 minutes later. and then another 4 minutes later. and then a 5th contraction, exactly 4 minutes later and I'm all like WHAAT? We're at 4 Minutes??? But I was going to go to the hospital when they were 5 minutes apart. Are we already at 4 minutes apart? Surely this isn't happening. I went back to bed, still leaving Joel to sleep since he was more useful to me well-rested and I really didn't feel like I needed him with the actual labor yet. But I told myself, if there is a 6th contraction at 4 minutes apart, I better wake him, aaaannnndddd we should probably get going. So I laid in bed and sure enough, 4 minutes and the 6th one came. And of course I thought that during this contraction would be a good time to tell him about it so I woke him up with my heavy breathing and whisper-yelling his name. He was totally dazed at what was going on. I told him I thought we needed to call our doula and see if we should go in. Just as he dialed the phone and tried handing it to me, I was realizing that I was having a contraction on top of my previous contraction (no break), and I thought I was going to throw up so I crawled over to the garbage can and stuck my head inside. 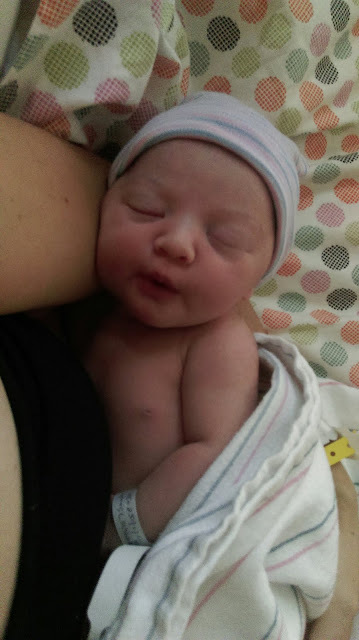 So the doula, kind and wise as she is, said it was time to go in, and that she'd meet us at the hospital. I had a few more contractions (always going back to the floor to be on my hands and knees) while we waited for our neighbor to come over, and then we hit the road. I was in the back seat so I could continue the hands-and-knees position, and Joel loves to chuckle at the memory of me next to the infant car seat in the back, which had a toy hooked up to it from it's previous tenant, and every couple minutes I would bump it by accident and it would start playing this stuuuupid song. And even in the moment, we laughed about it just a little bit. As Joel is pulling into the parking lot at 1:50, he asks if he should drop me off at the front, and I tell him emphatically no, I will be totally fine, and in my head I am thinking I have tons of walking ahead of me, so might as well get some steps in. Well we park and grab our stuff, and 10 steps in the middle of the parking lot I am hunched over in a contraction, unable to move. A car even drives in at this point, and it was just like one of those scenes from a movie. Joel told me he should have dropped me off. We walk in, another stop to contract, and up to L&D we go. Laura was already there waiting for us, and wow I realized in that moment how much I needed to see her! She immediately started rubbing my back in this way that, I swear, only another woman can, and I immediately felt better. It's like when you're sick and no matter how old you are, you just want your mom to come and take care of you. That's how I feel about my doula. She's like my mom, taking care of me like no one else can, in my greatest time of need, with the most knowing and calming touch. So, I hadn't preregistered (what am I, knew at this??? ), so I had to go and fill out some crazy stupid paperwork. And I kid you not, the women checking me in, I swear, had never seen a woman in labor before. I think it was her first day on the job. She was chatting away, dilly-dallying, taking her time, asking me to rePEAT myself, all this nonsense and there's me, leaning against her desk having multiple contractions, palms so sweaty they are leaving puddles on her desk, and she doesn't doesn't realize I need to G. O. GO!, and that I would give her my phone number and correct area code and properly spelled maiden name LATER. It was so hilarious and frustrating at the same time. 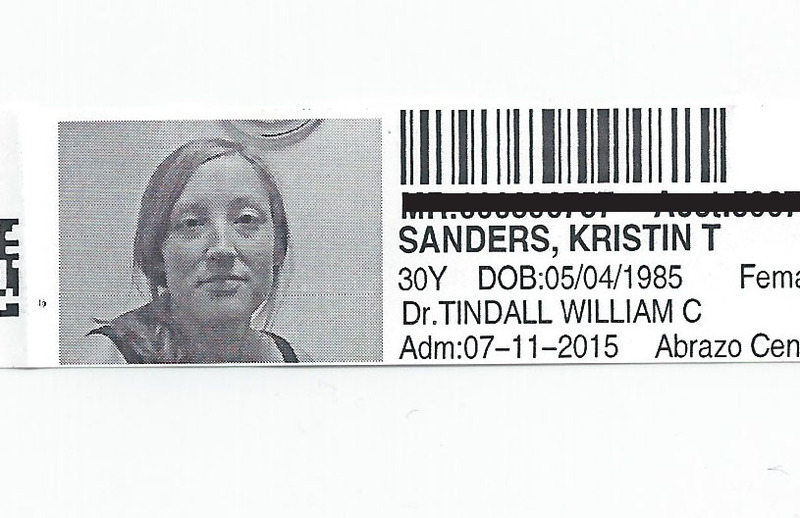 I even had to take my photo to put on my arm band, and she waited and waited to take it, waiting for me to smile but then realized I wasn't going to. HA! I have kept the arm band as charming memorabilia. So paperwork, correct contact information, and favorite color have been accounted for (etc.) and we move into triage to see where I was at. 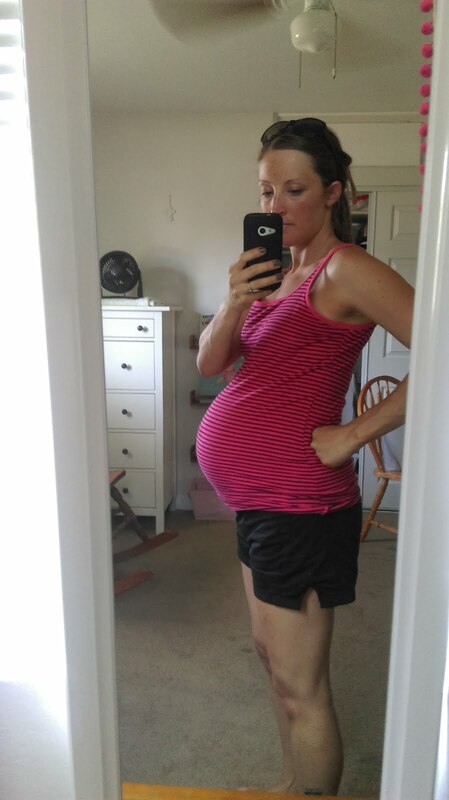 More contractions come as we wait, and I again feel nauseous and do some dry heaving, which takes me back to memories of Mia's birth, dry heaving within maybe an hour of giving birth to her. The attending OB comes in and I am so nervous that he is going to inadvertently slow down my labor, but he ends up being the nicest, kindest, gentlest OB ever, telling me a story of the birth of his grand child and totally putting me at ease. He checks me and I am 8cm (!!!) and I was so relieved!! Oh my goodness, so relieved I had progressed so much and it was (hopefully) near the end. He said the baby's head was in the correct position, but the neck was tilted up slightly which would probably, he said, make for some extra labor time. Then it was time to get into our L&D room and again, I was feeling like I needed to get some steps in, but 3 seconds after I stand up and have to stop walking to contract, Joel finally cuts the nonsense and tells me it's time to get a wheelchair and I concede. We got into our room around 2:40 and quite soon after arriving, I'm already feeling like it's going to be time to push soon. I told the nurses this, who were busy setting the room set up for labor, but it seemed like nobody really took my word for it except my doula, who is also a newly minted midwife and knew that I probably remember what it felt like to have to push a baby out. At this point I also felt like I had to pee but I knew I didn't really have to - it was probably all of the pressure I was feeling. Then my water broke, and my midwife and I knew we were super close. I asked the nurse in the room if she was ready to deliver the baby (since the OB, nor my midwife, were there yet) and she assured me she had done this before. 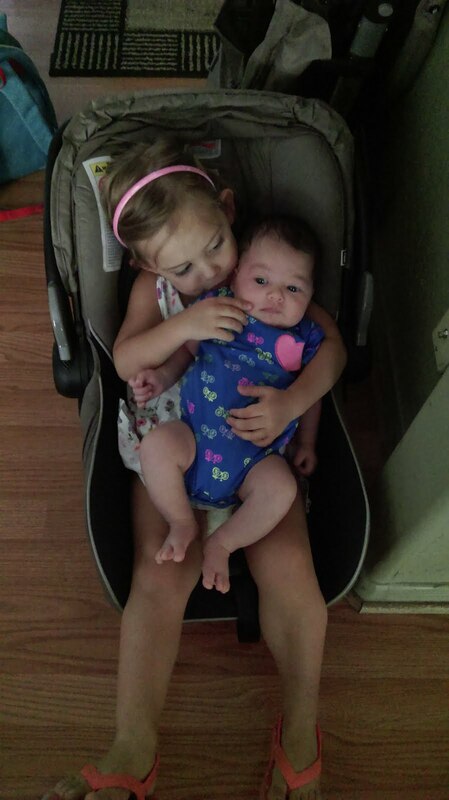 I was quite annoyed and didn't think she believed me that I was about to push the baby out. Laura immediately grabbed a pair of gloves, preparing to catch a baby if she had to. Also, the bed wasn't set up for birth, so I'm just laying in the regular ol' hospital bed still! A minute later, as I'm trying to keep my legs together and keep the baby in so the OB could get there in time, in he came and I started pushing as soon as the next urge came. It took about 2-3 pushes, and a one-minute stint at the crowning point (owweeee this part hurt much more than with Mia, who was a pound lighter at birth), and she was here! It all went so fast, nobody including us could really believe it. It was 3:02am, exactly 2 hours after my contractions sped up to 4 minutes apart and I realized I was in actual labor. 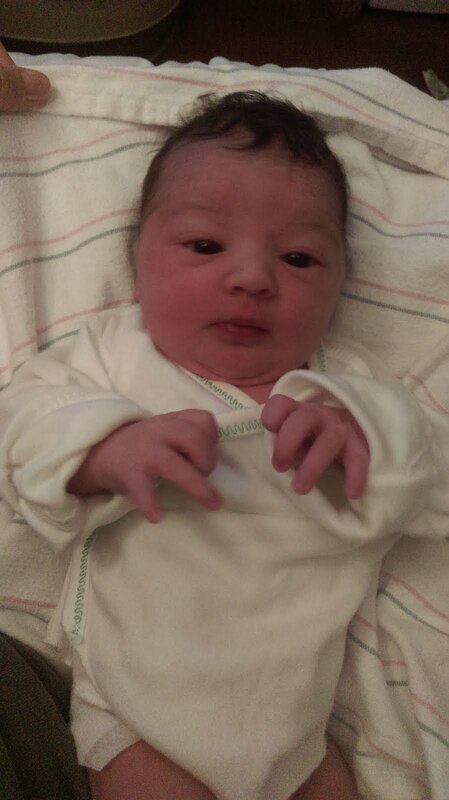 Dakota Therese was 6 lbs, 15 oz. She looked just like her sister, and I remember thinking it is so weird that she looked the same! The main difference is their eye shape (Mia's are much bigger and rounder), and Dakota's hair is curly. She was so sweet, she nursed for about 40 minutes right away, and slept like a champ. After that we called our parents, who were just getting up in the Eastern and Central time zones. Everyone (including us) was so surprised she was already here, based on the last experience of the loooong labor over two nights and a day. 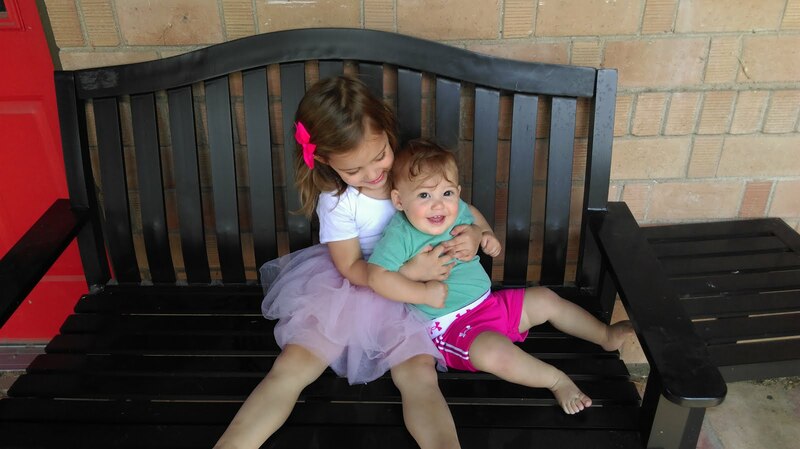 It has been so fun to see them grow together and love each other!! 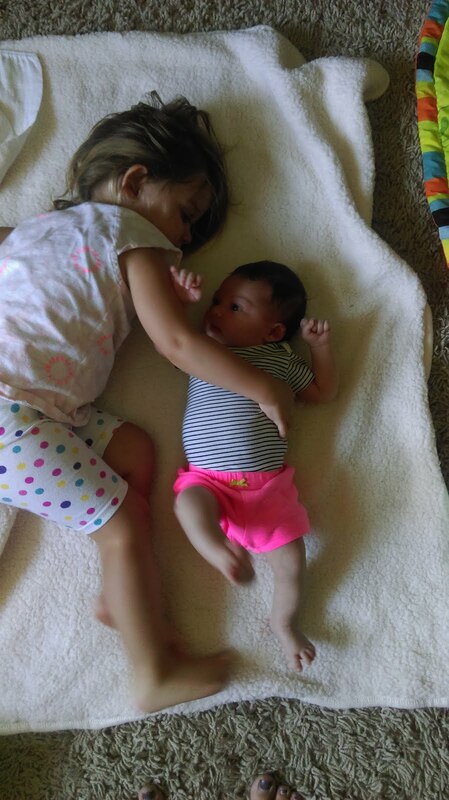 Mia definitely can't get enough of her sister, always wanting to touch / hold / tackle / steamroll / cuddle / play with her. And Dakota is understanding more and more where the party is at. We are having fun with these sweet girls!! I don't know what it is about books, but I just L O V E them. 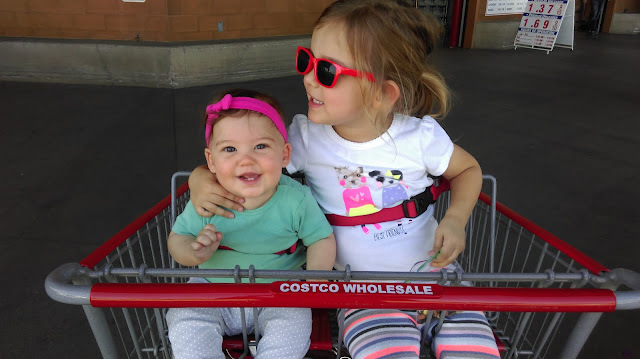 I will even admit that I love them (shopping for them, looking at them, holding them, storing them, decorating with them, owning them) even more than I love reading them. So stupid and lazy of me..moving on. So about a year ago, a mama friend of mine introduced me to what is called a Little Free Library, and you guys....I need to convert EVERYONE! 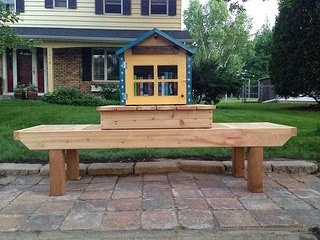 A Little Free Library (or you can really call it whatever you want) is a little, outdoor, open-to-the-public bird house type of tiny-ish, weatherproof building where you put books you are willing to let go of and share with the community. Then people stop by, and can take any book they want (and keep if they want), and other people (or the same people) BRING books that they are willing to share with the community as well. So, there is ideally a constant flow of books coming in and going out. 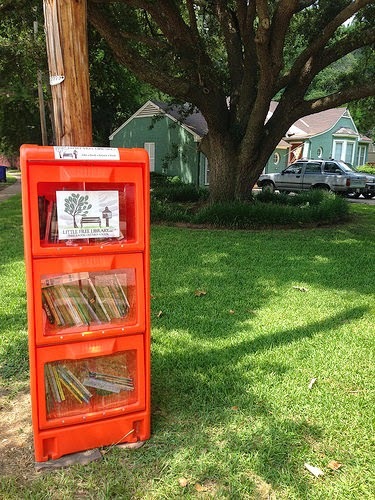 Very succinctly, the official tagline of the "official" Little Free Library is "Take a book, Leave a book." We built one for our front lawn last spring and you guys, it has been so much fun!!! 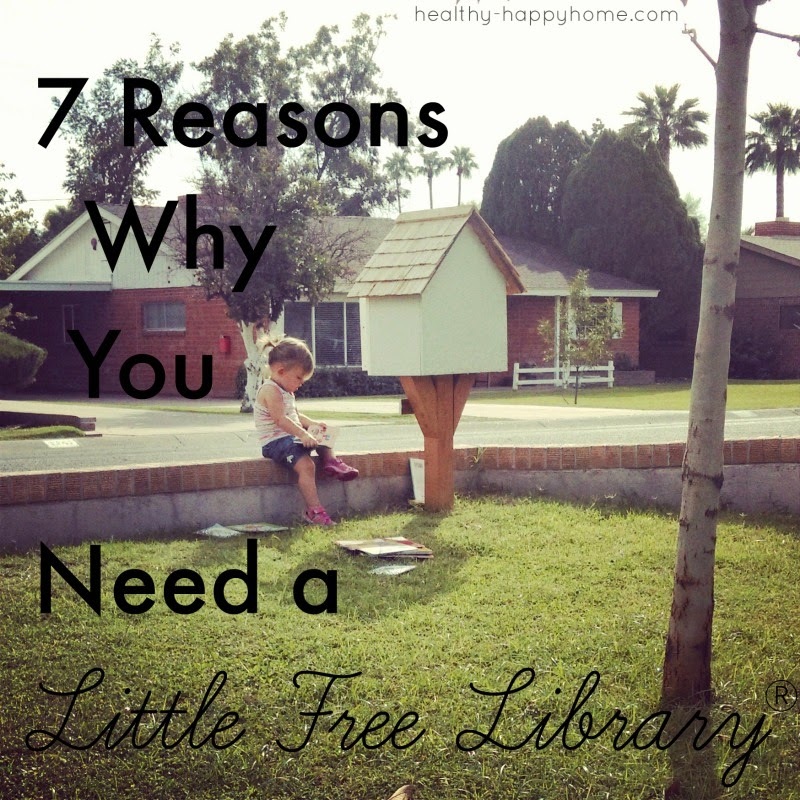 So here are my 7 reasons YOU need to start your own Little Free Library, along with some photos to spark some ideas! 1. It is a place you can "donate" books you no longer want -- Spring Cleaning is around the corner! 2. It's a place to share doubles of books that you received as gifts, etc. 3. It's a place to find new books or maybe even old books you've always wanted to read - and they are free! 4.. It's an awesome neighborhood community builder. It spreads neighborhood pride, good will, and promotes an atmosphere of community awareness and sharing. Generosity is a contagious thing...and I want THAT going around my neighborhood. A few weeks after we had ours up, I met a neighbor and after I explained where I lived she said "Oh! 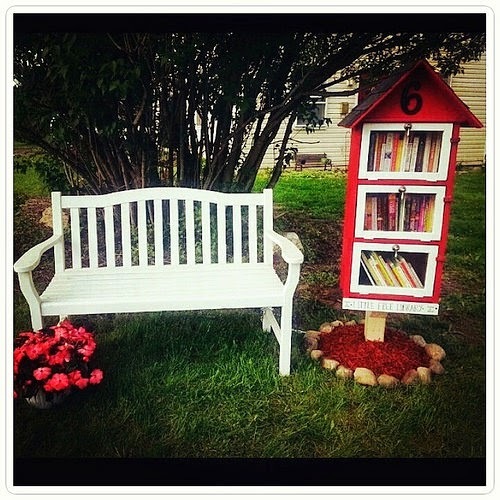 You are the one with the little library!! I posted a picture of it on Facebook and EVERYONE kept commenting on how they wished they had one in their neighborhood!!" 5. It's a cool way to meet people in your neighborhood - especially families with young kids (if you have kids, this is Very Good Information)! Seriously, we have now met almost everyone in our neighborhood because they stop by the little library with their kids (and we spend a good amount of time on our front lawn), or at neighborhood potlucks and things we are always introduced by others as "the ones with the cute little library in their front yard." People then remember us, stop by to check it out and say hi! Numerous older couples have even stopped by to make sure to thank us for adding something so nice to the hood. I feel like I have gained so much more than I have put into this! 6. 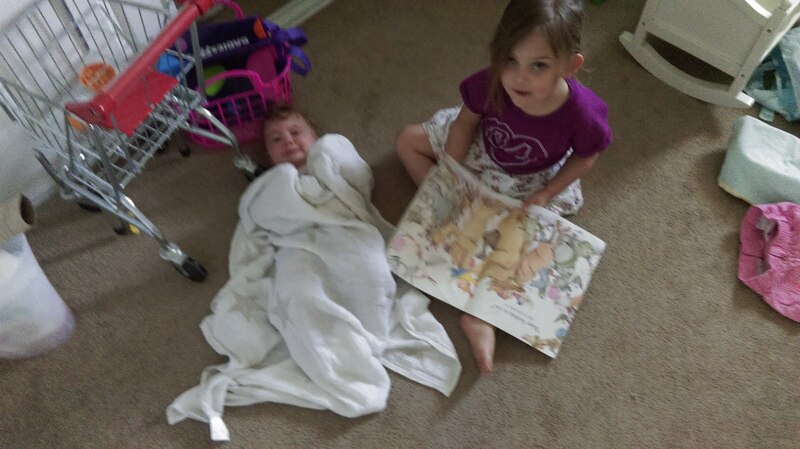 It teaches not only us adults, but our KIDS about sharing, community involvement, and a love for books. 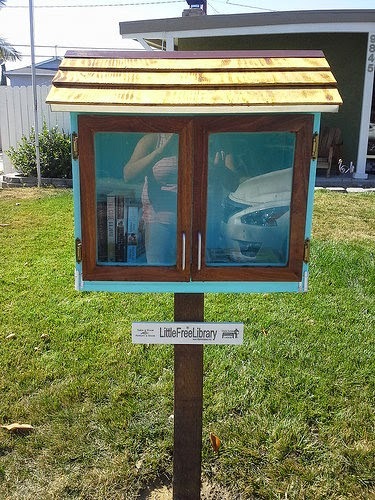 I can't wait to take Mia and my future kids on regular library outings, but wouldn't it also be so cool to have a mini library you can stop by within walking distance to your house - or in your front lawn??!! The answer is yes. Most days when we head out to the front lawn with some toys and a blanket, Mia wants to go grab a few books from the library, which usually has a a few new ones inside. How fun is that!? 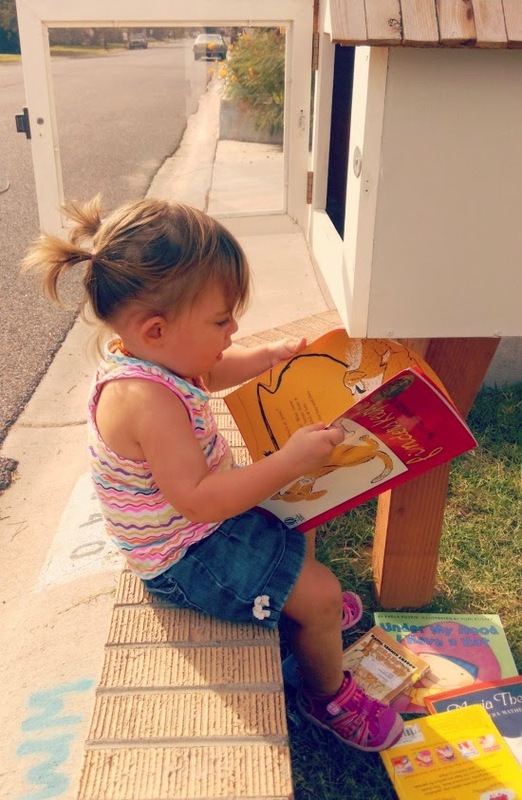 And when she gets older, she'll learn to understand that the books, even though they are in our front lawn, aren't "our" books but for the community to share. What a cool teaching tool, right? 7. 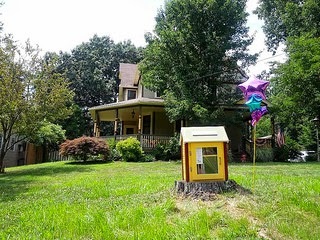 I have not spoken to anyone who knows anything about property valuation, but in my humble opinion, I honestly think that having a Little Free Library "anywhere" in one's neighborhood ups the property value for the entire hood. Think about it. 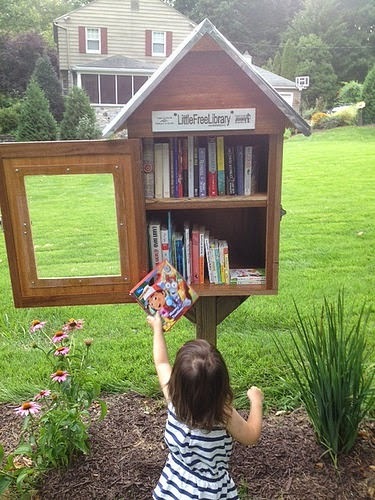 If you are in the market for a house, and two blocks down from a house that is for sale there is a Little Free Library - what does that tell you about the people in that neighborhood? To me, it says : "we are generous, we are trustworthy, we are community oriented, and you will love living here!" 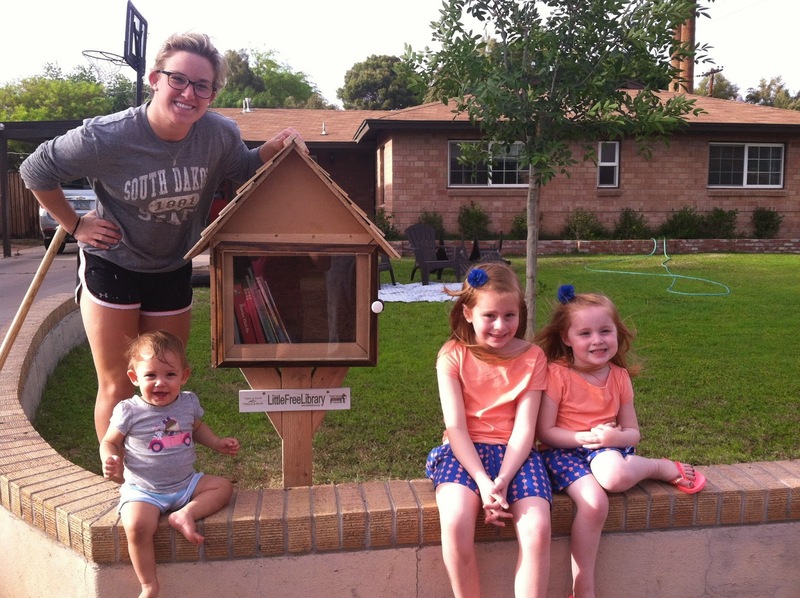 What could be a better way to Build, Grow, and Show a community spirit than a Little Free Library?! OK, so now you want one, don't you. I know you do. Here are a few things to know, and the only 3 things you need to get started! --You absolutely do not need to be a part of this network to start your own library. You can call it whatever you want, make your own sign, etc etc. I personally joined the network to have the sign and be on the map because I wanted to "donate" to the nonprofit that helps promote these, and I thought that was super fun and worth it to me to have the sign and be on the map, but again...absolutely Not Necessary. --One of the things that the LFL network really stresses is that to have one such Library on your property, the idea of stewardship is really important. Now, whether or not you join this network, I still think it is worth mentioning. They emphasize that the owners of the library are really the Steward of the library, taking care of any needed upkeep, maybe keeping it looking nice, filled with books if it gets low, obviously providing the initial materials, etc., but it is not "their" library where others borrow books "from them." In other words, it is the Neighborhood's Library, and the "owner" has volunteered to take care of it for everyone. I think this is such a cool concept as well, one that I think casts a super generous and positive spirit over the whole thing, and encourages others to have a little tiny bit of ownership in it as well. Again...promoting that community spirit. SO - here are the 3 things you need!! Our LFL just after my dad built it, before I painted it. 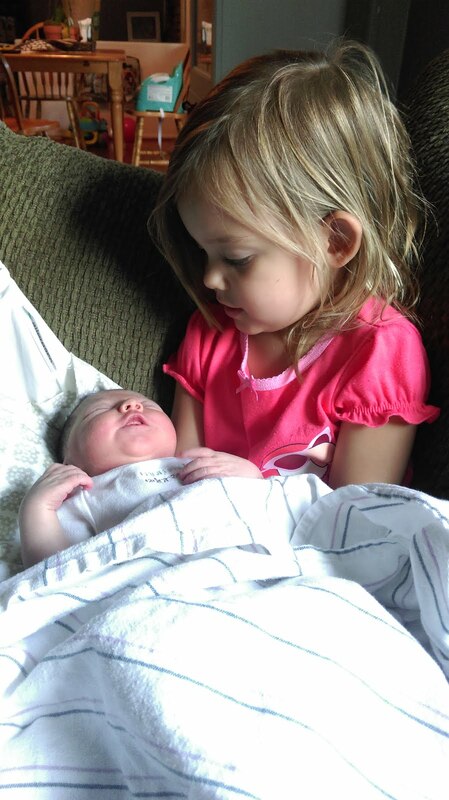 That's my sister, Little Mia, and my two nieces! 1. A weatherproof, especially waterproof, box. Most LFL's have a glass door on the front so the books can be seen. I LOVE looking at the Little Free Library Instagram feed and #littlefreelibrary IG hashtag...especially when I was trying to design ours, but even still - they are so creative and make me so happy to see! My dad built ours from a bunch of scrap wood, very few pieces he needed to purchase, and a picture frame for the front door! 2. Books! When we first built the library, besides adding a few books I already owned and didn't need anymore, I went down to a local thrift store and bought about $5 worth of books on a 50% off day - which was about 30 books! I started by filling it with kids books, and now it is about 50-50 kids and adult books. 3. A sign that explains how it works. This is super important, as even still, people ask me to explain how it works. It just needs to be something that explains - "Please take a book to keep or borrow, and/or leave a book you would like donate" (making sure they understand they may never see this book again). I have even considered adding a little chalk board paint to the top front of the library to explain a little more, because even the LFL Netowork's sign that says "Take a book, Leave a book" still leaves people not quite sure. 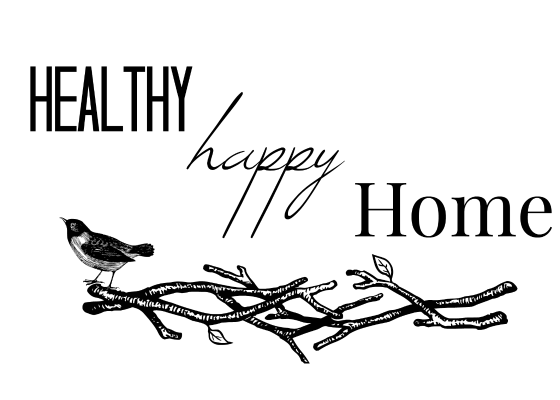 Or maybe it just needs to be in bigger letters...I'm still experimenting. 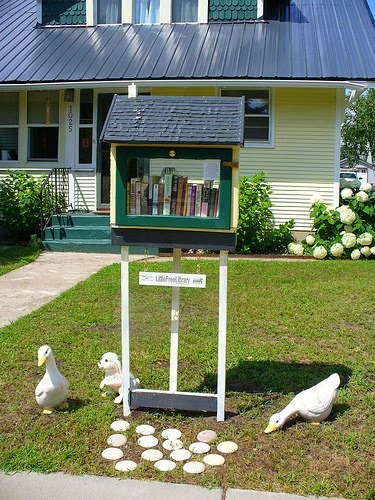 Check out the Little Free Library website for more cool photos, ideas and resources!! And head over to the rest of the 7 Quick Takes Party at This Ain't the Lyceum!! 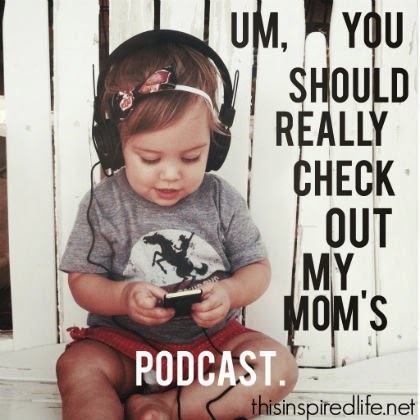 A podcast featuring interviews to inspire, entertain, and encourage you in this crazy, busy, wonderful, faith-filled mama life.